I really, really wanted to visit Scotland this semester, so I made sure to cram an Edinburgh weekend into my schedule. However, due to various circumstances (in particular, the limited and expensive flight options), I only managed to have about one and a half days to spend in the city. As you can probably guess, this was not nearly enough time for the full Edinburgh experience. This also meant that, when it came to planning my too-brief stay, I had to be ruthless about what to include in my itinerary; only the places I really wanted to see could make the cut. One agenda item I was on the fence about? A food tour. 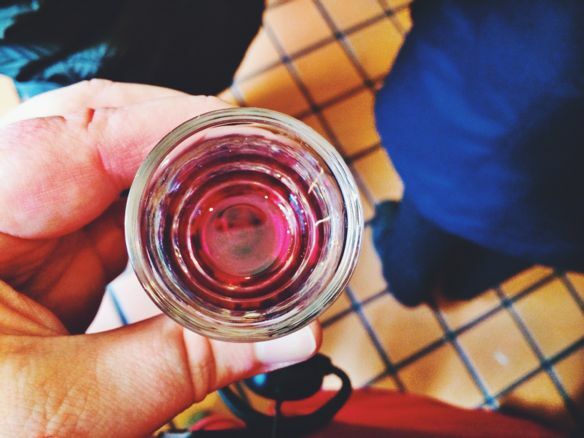 Taking a food and drink walking tour became something of a tradition for me this semester (I’ve already written about the ones I did in Lisbon and Budapest, and there are more to come in future posts). Because I had such positive experiences in other cities, I knew I wanted to take a food tour in Edinburgh too. Yet, the one I wanted to take with Eat Walk Edinburgh was three hours long, and in a packed weekend, that was a big chunk of time to lose – plus, in my experience, these tours usually run over their stated length. 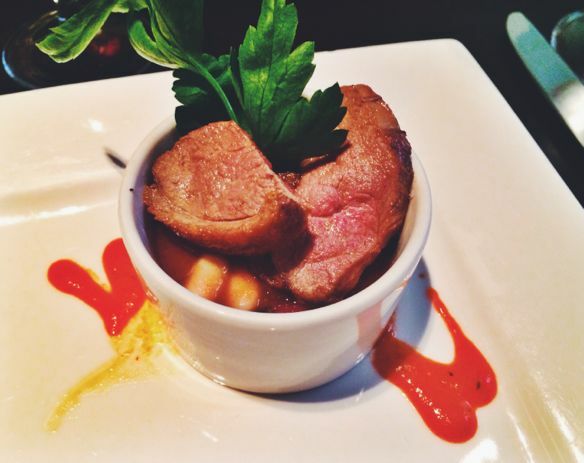 Would it be worth it to spend so much of my time in Edinburgh on foodie pursuits? Ultimately – and obviously, from the very existence of this blog post – I opted to sign up for the tour, and the answer to “Was it worth it?” wound up being a resounding “yes.” I took the Old and New Town Tour from Eat Walk Edinburgh, and it was a wonderful experience: a friendly tour guide (and equally friendly fellow tour group members), an educational and informative walk around the city, and – above all – some really tasty food. Plus, though we did focus on eating and drinking, we also learned quite a bit about the history of the city and walked by several landmarks, meaning I didn’t feel like I was missing out on seeing other things by taking the tour. We began at the Hotel du Vin, a former asylum turned boutique hotel and bistro. 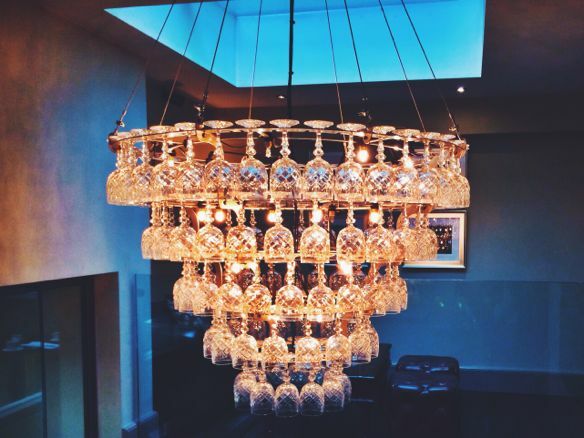 The hotel itself was beautiful – I loved the chandelier made of wine glasses – and the food was great, too. 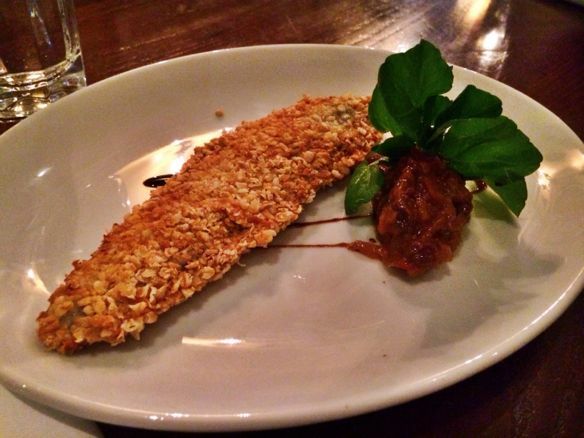 We tried a breaded herring, and while many people in my group found it “too fishy,” I thought it was a delicious way to kick things off. 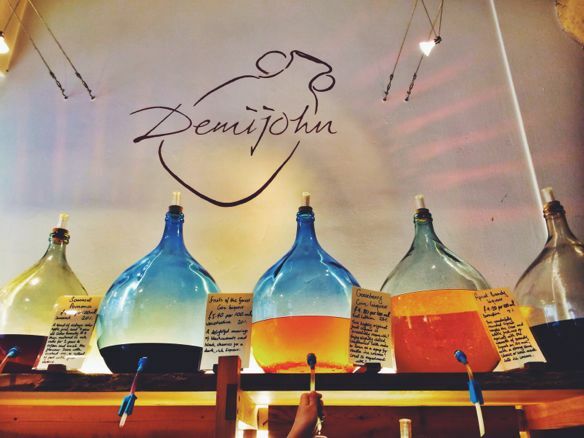 Next, we walked over to Demijohn, billed as “The World’s First Liquid Deli.” Demijohn is stocked with a wide range of artisanal liqueurs, oils, and vinegars, and we each got to sample a liqueur. I opted for the Morello Cherry Liqueur because not only do I like cherries, but “Morello” also happens to be my mother’s maiden name, and so I always order things with Morello cherries when I spot them. The liqueur was delicious, and if I had more space in my luggage, I just might have purchased some to take “home” to Geneva. Our first two stops of the day had been in Edinburgh’s Old Town, but for the remainder of our tour, we headed to the “New Town” area (which, especially by American standards, is still pretty old; it was built starting in 1765). I loved this part of town; the streets felt energetic, but also still relatively charming and quaint. 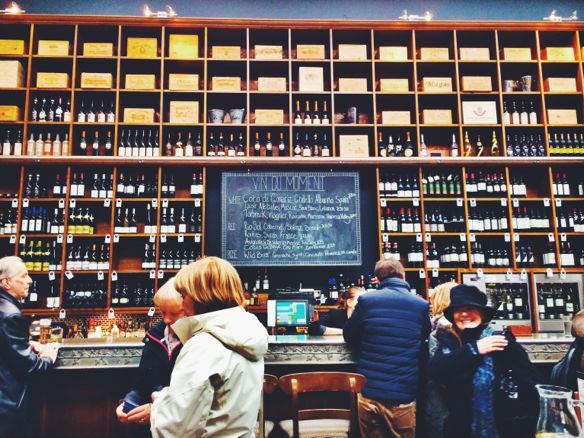 Our first stop in New Town was Calistoga Restaurant, which specializes in California wines and California-inspired food flavors. At first, I found this choice odd: this is a food tour in Scotland and we’re going to a California-style restaurant? However, though nothing about the place was quintessentially Scottish, it won me over by serving delicious food and wine. We had an appetizer-sized portion of duck with bean stew (the duck was tender and perfectly cooked) and a Rhiannon blended red wine. I also appreciated that this was a restaurant I would never have found on my own; it was tucked away into a tiny, nondescript lane that I would have easily dismissed. Places like Calistoga, then, are exactly why I keep taking food tours: you discover eateries that you never would as a plain old tourist. 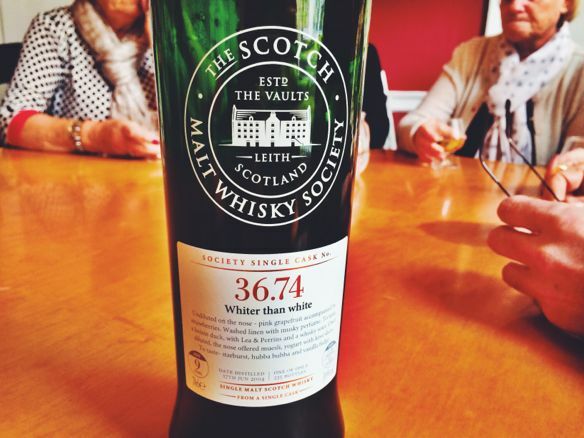 Next, we headed to the Scotch Malt Whisky Society, which was one of the highlights of the tour for me. First up, we sampled some whisky. As I learned last year when touring the Bushmills Distillery in Northern Ireland, drinking straight whisky is a bit of a challenge for me – and this held true in Scotland as well. We tried a single malt, aged nine years. It was good (or at least as “good” as whisky can be to me) but – let’s be honest – I had to add quite a bit of water to finish my entire drink. …and discovered that it was actually delicious! It simply tasted like any good meat dish, and if I hadn’t known what haggis was made of, I would not have thought twice about eating it. 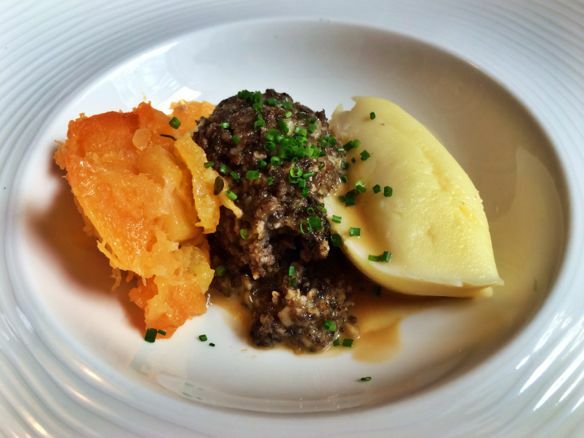 I hope to return to Scotland one day, and I would not hesitate to eat haggis again. Even though we were pretty full by that point, we still had a few stops left. Next up: Le De-Vin, a wine bar a few blocks away. I really loved the atmosphere at Le De-Vin; our guide mentioned that it’s a popular spot to head after work with friends for a drink, and with its friendly, relaxed-but-classy atmosphere, I can see why. 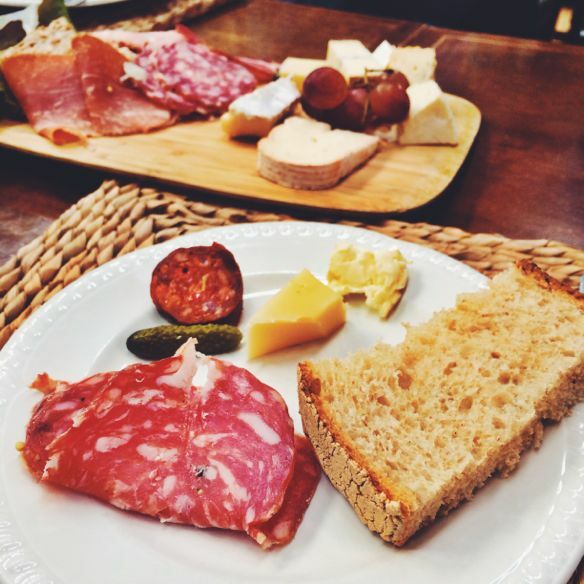 The food and drinks were also great here; we tried a white wine with a charcuterie plate. Finally, it was time for “pudding” (aka, dessert) at Ghillie Dhu. 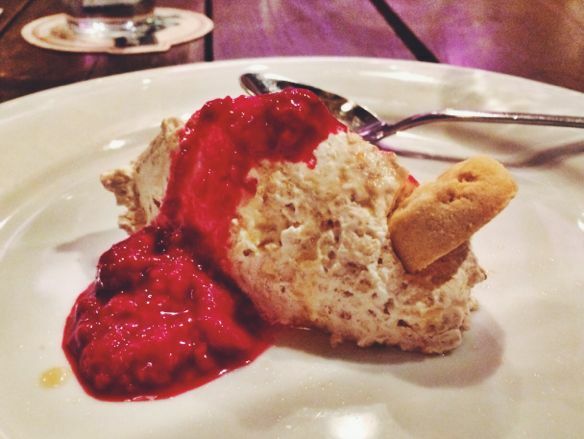 We tried cranachan, a traditional Scottish dessert made with oatmeal, raspberries, and whipped cream. This was an interesting dessert: it wasn’t overly sweet, and it had a unique texture due to the oatmeal. Still, after an indulgent afternoon, it was nice to have a dessert that was not over-the-top sweet. When all was said and done, I spent well over four hours walking around town and sampling culinary treats with Eat Walk Edinburgh. Though this meant that there were a few museums I didn’t get a chance to visit, I considered it a fair tradeoff: sometimes, rather than looking at artifacts indoors, I’d just rather get out and experience a city. 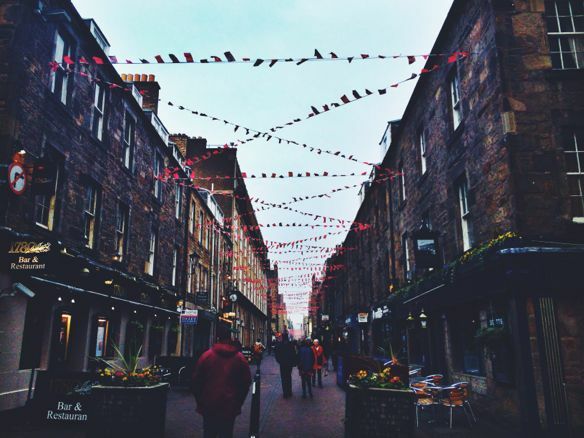 By visiting restaurants in both Old and New Town, I felt like I got a good introduction to not just the culinary scene in Edinburgh but also to the pulse of the city itself. It was a worthwhile addition to my jam-packed weekend in Scotland.